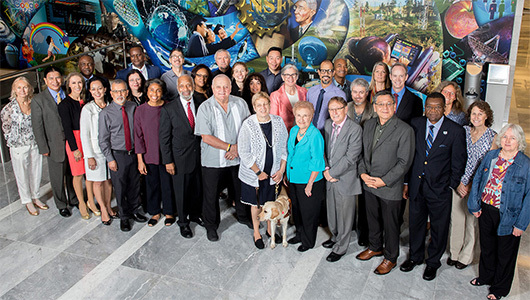 Manuel Acevedo, director of WSU’s Multicultural Student Services and point-person for Team Mentoring Program (TMP), traveled to Washington, D.C., in June to accept the award from the National Science Foundation, which administers it on behalf of the White House Office of Science and Technology Policy. “I’m really proud of the entire team — the program leaders, the faculty and peer mentors, our sponsors — all of whom deserve to be recognized for enhancing the educational experience of our students,” Acevedo said. 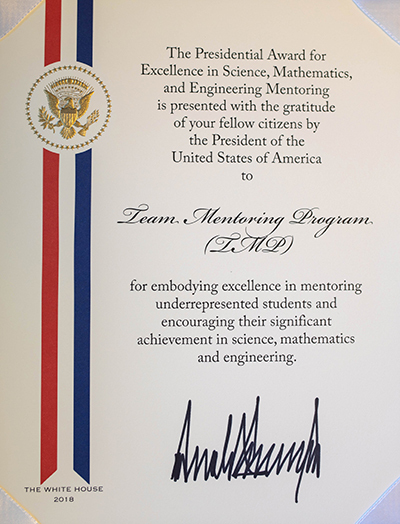 While visiting the nation’s capital, he and the other award recipients from around the country, participated in the White House State-Federal STEM Summit. Officials there unveiled a draft five-year strategic plan for moving STEM education forward in the United States. Acevedo had the opportunity to study the plan and provide feedback on its various components. “It is evident they understand the importance of STEM education, and I’m glad we had a chance to push the envelope and advocate for underrepresented students,” he said. When Acevedo was notified in the spring that TMP was being considered for the award, it came as a pleasant surprise. He and Kay Brothers, a TMP leader from WSU’s Integrated Program in Biomedical Sciences, nominated the program for the award three years ago and almost forgot they had done so. Brothers believes the collaborative nature of TMP, which garners support and leadership from all of WSU’s STEM disciplines, has contributed to its success. But it is the fact that TMP originated in Student Affairs that sets in apart from similar programs across the country. Bob Olsen, professor emeritus in the College of Engineering and Architecture, remembers strategizing with Acevedo and Mary Sanchez-Lanier, clinical associate professor in the Office of Undergraduate Education, on effective ways to provide underrepresented students encouragement and support in STEM classes. “At the time we didn’t have a roadmap to follow, so we created our own,” said Olsen. They determined the best approach is a comprehensive one that involves mentoring by faculty, peers, and alumni, specialized training and workshops inside and outside the classroom, research opportunities, and meaningful connections with industry partners. These became the core initiatives of TMP. The strategies employed by TMP, along with other services implemented since 2007, have had a profound impact on the number of underrepresented students graduating with engineering degrees from WSU. According to the American Society for Engineering Education, 140 students of color received undergraduate engineering degrees at WSU in 2017, compared with 42 in 2007. The number of female graduates rose from 32 in 2007, to 114 in 2017. Included in those statistics is Tia Chen, and electrical engineer in Seattle who designs electrical systems in commercial buildings. She joined TMP as a mentee during her second year at WSU, and because she found the experience to be so beneficial, she became a mentor the following year. One of her former mentees is currently a successful engineer in Portland. She remembers tutoring him and helping him navigate through the course requirements. Later he told her that if it wasn’t for her help, he probably would have given-up on becoming an engineer. Brothers said the program’s increased notoriety has made more WSU faculty interested in it. Some are researching how they can adopt some of its methods to enrich the interactions they have with students. Program leaders also hope the increased recognition will result in more opportunities to create corporate sponsorships. They attribute much of the program’s success to The Boeing Company, Washington Research Foundation, AT&T, and Bank of America. Top photo: TMP leader J. Manuel Acevedo (1st row, fifth from left) with others receiving the Presidential Award for Excellence in Science, Mathematics, and Engineering Mentoring in Washington, D.C.